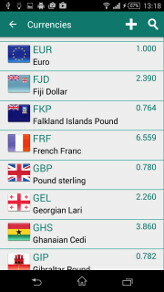 Currency exchange rate calculator and exchange rates list for your android device. Download “Currency Converter” right now to get the most recent foreign currencies conversion rates from all around the world. It’s is free and always accessible even when you are offline. It is easy to use and it does the currency conversion of up to 15 foreign currencies at once. 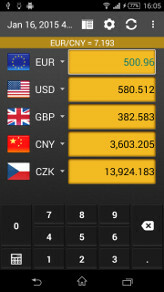 “Currency Converter” is not just another free android foreign exchange rates calculator. It also has an exchange rates lists, and graphs with historic data. Quick conversion takes place right away - just by typing the numbers. 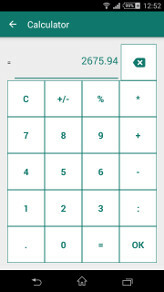 Use the built-in currencies converter calculator to do some math. Result is instantly converted to all currencies. Can't find your currency? Add it with a new currency code and run the update. 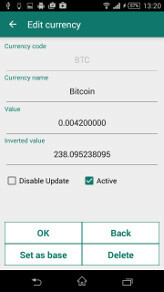 App will download currency’s name and fresh exchange rate. WHY IS IT AMAZING AND UNIQUE? ★ Currency converter app runs on phones, tablets and android wear watches. ★ Convert up to 15 currencies on screen. ★ Whole world currencies and precious metals. ★ Works in offline mode, which means no roaming prices. ★ Has filter of currencies, just press search in list. ★ Set your own style and color theme. 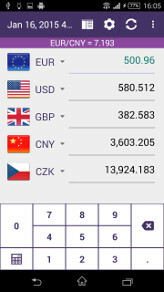 ★ Manually add any currency not In exchange rates list. Copyright Halmi.sk . All Rights Reserved.